Usually by the time the sun comes up for the morning of a race, I am already as woke as a Bernie Sanders supporter who refused to vote for Hilary to teach the establishment a lesson (how’s that working out for y’all). But after the amazing wedding of Mike and Marla the night, the alarm clock was needed on this particular occasion. Thankfully we got there plenty early. The Casino car park and entrance ways were swarming with people when we arrived soon after 7 AM. The walkers had just set off, but many runners were already there. The Just Like Jack team had tucked themselves out of the way as best they could, but were still easy to find. I met up with Beau, a little legend who I would be pushing to Ferntree for the Point to Pub, before rejoining the team that were heading to the pinnacle. I did my own final preparations, including putting on about three coats of sunscreen, and kept my eyes open for the many friends I knew would be running today. Flushed with pre-race adrenaline as I was, I tended to greet anyone I met with the kind of excitement usually reserved for guests on the Oprah Winfrey Show. ​Beau and I started to move towards the start line, as the rest of the Just Like Jack team got into position. 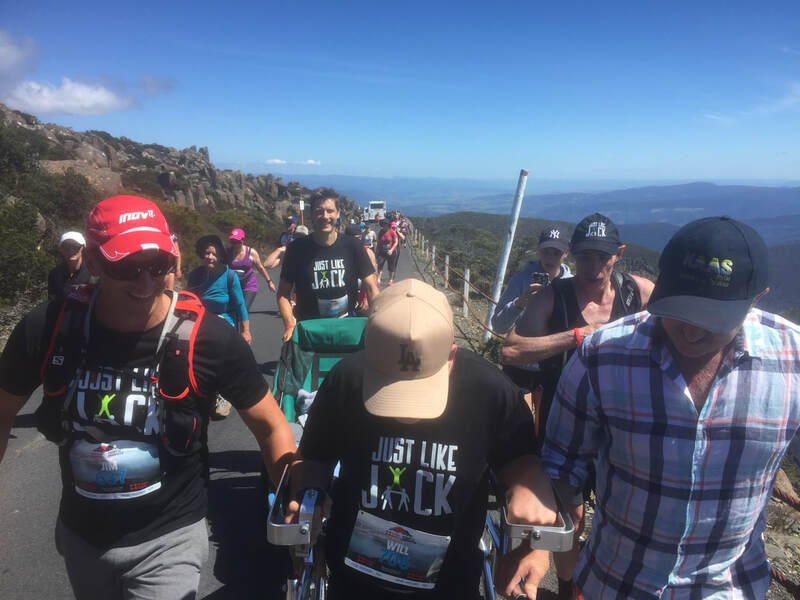 This year Just Like Jack was helping five kids participate in the Point to Pinnacle with an army of nearly 50 runners and walkers, pushing or just participating in their own right as well. Me and Beau had planned to set off pretty quickly from the start, but that just wasn’t possible. 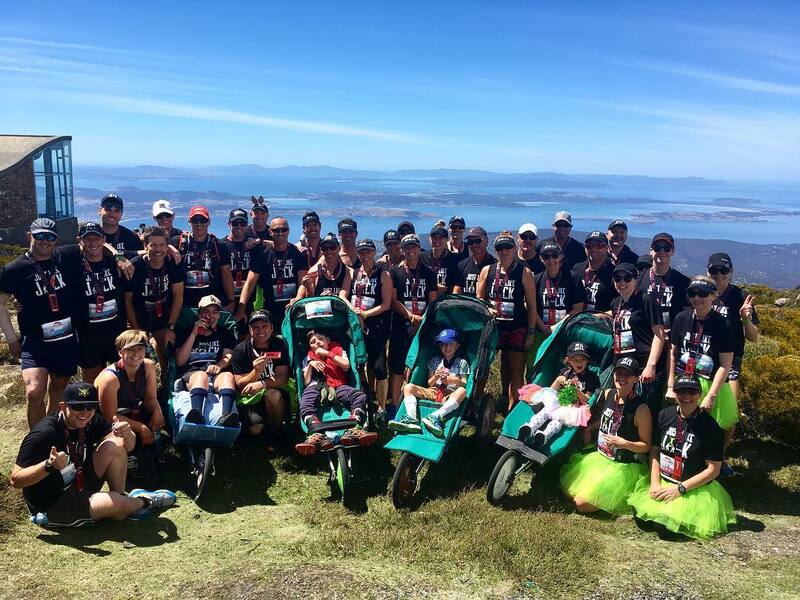 There was no way to get Beau’s chair through the thousands of people who were tightly packed between us and the start line, so we waited patiently (well I’m calling it patiently now) for the starter’s gun and then shuffled forward towards the start line. We crossed the start line about four minutes after the gun and began weaving our way through the field. This was still pretty hard as there were people walking and running at all speeds, but on the plus side I got to say hello to a heap more of my friends as I came up alongside them during the race. I had cleared the majority of the walkers by the end of Sandy Bay Road, but Byron Street proved a bit of a roadblock with a lot of people moving as slowly as Australia’s internet speed (thanks Liberal government). Beau and I decided that was a time to make a bit of a move, so we pushed ourselves out to the right and made plenty of noise to let people know we were coming past. After last night’s wedding, it was fair to say that my race preparation was far from on point. Added to that I had probably spent less time running up hills this year than George Christenson (and I don’t count the time he spends pushing the proverbial uphill either) so it didn’t take long for my legs to register their displeasure at our pace, but I tried to push that to the back of my mind and chatted to Beau to keep us both entertained. I was relieved to get to the top of Byron Street and turn onto the long flat stretch of Davey Street. I got a shout from Sharene, the Solemates First Lady, and soon after caught up to my friend Sarah. I was super proud to see her too as she had set herself the goal of running this race at the start of the year to raise money for her best friend; and had worked really hard in training. Of course my pride and excitement at seeing her didn’t stop me running across in front of her and threatening a bit of light crop dusting before continuing on my way. The top end of Davey Street began to climb again but me we were actually starting to feel better. We tended to maintain a fairly erratic pace, at times slowing behind other runners and recovering our energy, before accelerating to overtake. I rounded the bend and was soon approaching the Skyline Service Station. The top section of South Hobart had more supporters than Susan Neil-Fraser and I saw Andrew and Allison from The Map Shop cheering on the edge of the road as I approached, giving them a quick wave as I began to gradually slow for the first drinks station. One of the things I hadn’t counted on with pushing a chair was my nutrition plan went out the window from the start, as I couldn’t really access food and eat whilst pushing (I probably could have done all this one-handed as I didn’t have a problem doing the same in the Ironman, but I had not set myself up to do so). As a result, apart from grabbing a cup of water at the drinks stations, I didn’t take on much food or drink for the first ten kilometres. You forget how long and steep the next section is, with the road winding ever closer to the monolithic stone summit that rises way above. I was still getting plenty of chat and encouragement from runners as I passed and Beau was high fiving people like a champ. The next drink station was at the lower section of Ferntree and I came to an almost complete stop to take on water before continuing on. I remembered when I ran through this section last year there had been a group of particularly boisterous supporters with humorous placards and wondered if they would be back again. Sure enough, little more than 50 metres further on they appeared, not just providing some light hearted encouragement but also offering some lollies which I happily accepted as well. I knew I was getting close to the Ferntree Tavern by now and the road had finally thinned out enough for me to run at full speed without dodging other runners, so I picked up the pace for the last few kilometres, enjoying the shade offered by the thick vegetation on both sides of the road. We passed the turnoff for Pinnacle Road and soon after crossed the finish line at the Ferntree Tavern, where Beau’s Pop, Dave, was waiting for me. It would have been a really nice place to stop too, as the music had already started and the BBQ was about to kick off. Perhaps unfortunately, I wasn’t finished for the day so I grabbed my phone and a bottle of water, said goodbye to Beau and set off again, jogging back down the mountain. I elicited a number of surprised responses as I headed back towards town, but after little more than a kilometre I found who I was looking for. Will- by far the largest of the Just Like Jack kids- was being pushed by a team of four. Reaching the group, I turned around once more and began making my way back up the mountain again, rotating in for shifts pushing the chair when my turn came up. We passed the bagpipers just below Pinnacle Road and then turned onto the road itself. The increase in gradient was obvious right from the start, although it lessened at times as we made our way further up. It was a beautiful day. The forecast warm weather had come through, with the sun beaming down on us and the wind making itself scarce like Turnbull and Abbott respectively after the Marriage Equality vote. After the savage cold and rainy conditions of last year forced the race director to change the course so that it turned around half way and headed back to Wrest Point, the heat was very welcome as far as I was concerned. We passed the turnaround point from the previous year fairly soon after turning onto Pinnacle Road and we were all feeling pretty good. The last of the houses soon disappeared and we were once again bordered by the tall trees on either side of the road. After a few more kilometres of climbing we took a big left turn and the road flattened a little approaching The Springs. The Springs itself was busier than Australia’s High Court during the citizenship scandal. There were drinks and lollies on the tables, heaps of volunteers cheering us on and even someone with a hose to cool us down. Sadly we couldn’t actually stay there as we still had a race to finish. Will was starting to get hungry as well. As I hadn’t been eating as I intended, I still had half of my Wiggle Bar left so I gave him that, but we were definitely a bit short of food for the big boy. I ran a little way ahead and grabbed a muesli bar from the team pushing Jack. Another runner overheard me asking for food and kindly offered one of her bars as well. I gladly accepted the offer and jogged back, resisting the urge to strut with pride at my successful hunter gathering efforts. ​The hill was definitely getting a bit steeper though. Our pace slowed but we continued to eat away at the distance to the top. Challenging The Mountain is not a feat to attempt lightly (as any Game of Thrones watcher will attest) and we were passing more and more athletes staggering slowly or stopped on the edge of the road. We grabbed another drink at The Chalet and steeled ourselves for the final climb. It was about this time that I looked up to see Banana Man, aka Ben Hirst, aka Run for Mental Health cruising towards us on his way back down the hill. Having already finished, Ben was on his way back down to help his brother who was further back. The road began to flatten out as we approached the last sweeping bend a couple of kilometres from the summit. Not that many of the tired runners and walkers around us seemed to notice. Once your legs are that cooked and under unrelenting heat any minor gradient can seem much greater than it is. As a result, tired competitors were collapsing as quickly as the English batting line up. ​By this stage many of them had been walking for over four hours in the heat with little food or water so it was understandable. Karl Marx once said, “From each according to their means to each according to his needs,” and since I had far more than I needed, I began offering electrolyte tablets to people as I passed in a way that could easily have gotten me into trouble with Duterte’s drug squads if I was in the Philippines. A few hundred metres from the finish, we caught up with Team Sophie, who had walked, and both teams approached the finish line together. About 100 metres short we stopped and both kids got out of their chairs to walk the last section. It was a supremely emotional moment. Watching two great kids battle their way over the finish line, followed by their support teams was something I felt really proud to be part of.